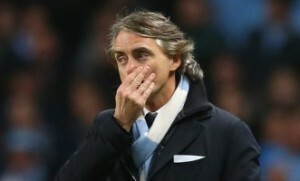 It has been revealed that Roberto Mancini blasted the attitude of his Manchester City players after defeat at Tottenham. The cash rich Premier League club threw away a one-goal lead at Spurs and a win for rivals Manchester United tonight will now secure the title. Second-placed City trail United by 13 points with five games to go — after collapsing at Spurs with 15 minutes left. And Alex Ferguson’s side can tie up the title by beating Aston Villa at Old Trafford tonight. Mancini insisted: “United deserve to win the title but they are not a better team.